Hammocks are a staple of outdoor relaxation. Whether they’re hung between two sturdy trees or patio supports, these simple swaying beds let you enjoy the fresh breeze and warm sun. While they’re predominantly used in tropical locales, hammocks aren’t just limited to outdoor use. Indoor hammocks have all the same perks as outdoor models, plus the added benefits of indoor amenities. They can be used to watch television, lounge around, or even sleep. Hammocks are great on the back, relatively affordable, and versatile enough to fit into homes with limited space. There are a number of great indoor hammocks available to fit any space. They provide the comfort one would expect from an outdoor option but include unique features like stands, supports, and extra cushions that will make them fit right in with other furniture. Here are 5 of the best indoor hammocks to complete your hangout space. If you’re looking for a unique option that takes up less space, this hammock chair is ideal. Instead of being hung at two opposite sides, the chair is hung from above. Each end is attached to a long separation bar that provides ample room to sit, stretch out, and lay out. The hammock is 73 inches long and made from strong fabric, utilizing rope on either side to prevents users from tearing it or falling through. It’s also very soft for maximum comfort. In total, the hammock chair can support 330 pounds. A cool cup holder is also included. Made from woven rope, the holder hangs from the separation bar to keep your drink close at all times. The hammock also comes with ceiling mounting hardware. This hammock chair is carefully crafted to put you in an upright position. Perfect for watching television or playing video games, the chair can be hung from the ceiling or used with a separate stand. It’s made from soft polyester rope and comes in a number of bright and muted colors. 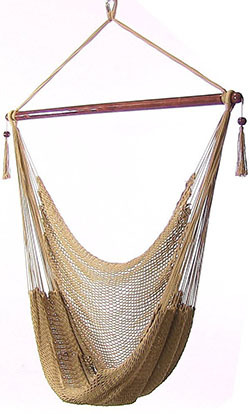 A spreader bar is used above the seat to hold onto the two ends of the hammock. It measures roughly 47 inches wide to create a wide and comfortable seat. There are two decorative tassels on either end of the spreader bar for a bit of extra flair. The hammock is lightweight for easy transport and can be hung in a matter of minutes. It can support up to 300 pounds. 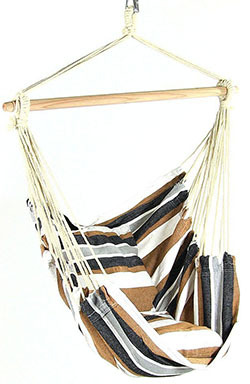 This hammock from Sunnydaze Decor comes with everything you’d need to make it a permanent fixture in your hangout. Instead of worrying about wall support, a durable metal stand is included. It’s 12 feet long and doesn’t require any additional tools to assemble. 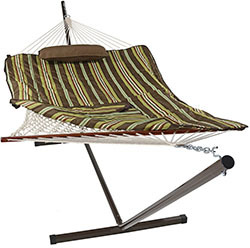 The hammock itself measures roughly 76 inches long and 56 inches wide, providing plenty of lounging room. It’s made from durable cotton rope and can support up to 275 pounds. If you need even more comfort, a sleeping pad is included. The pad is made from acrylic fabric and polyester quilting. The fabric is durable enough to withstand the elements, so it’ll surely remain in good condition for many years inside. It’s available in a variety of different patterns and even comes with a head pillow. 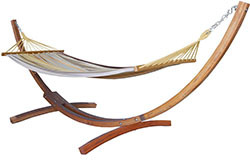 With it’s sleek and modern design, this hammock from Prime Garden has the same look as high-end furniture. It comes with a stand made from imported Russian pine. The pine is curved to create a dramatic arch that supports the ends of the hammock on either side. It’s then covered in varnish to protect the wood while bringing out its beauty. 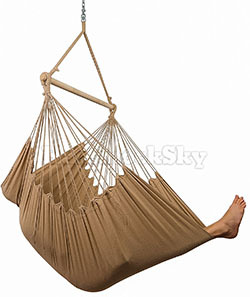 The hammock is made from canvas and measures 76 inches long by 48 inches wide. Two wooden slats are placed on either end. The slats have holes for the support ropes to go through. They keep the hammock opened up, allowing you to take full advantage of its width during a nap. It can support up to 275 pounds in total. Another great option from Sunnydaze Decor, this hammock chair is small, easy to use, and comfortable. It can be hung via a separate C-stand or with ceiling mounts. The main hammock is made from cotton and polyester canvas. It’s soft and durable enough to hold up to 264 pounds. The quarter-inch rope is used to support the fabric. It’s attached to a 36-inch separation bar to create a perfectly-sized seat. As if the canvas wasn’t comfortable enough, two pillows are included with the hammock chair. They can be used as a bottom and back cushion for the best relaxation. It also comes in a variety of different canvas patterns and rope colors. Hammocks need sturdy anchor points in order to support your body weight. Typically, trees used because the strong wood and complex root system ensure that they’re not going anywhere. Unfortunately, finding a good support indoors isn’t as easy. There are a few different ways to hang a hammock indoors. Wall studs are the vertical supports of your home. Studs are placed roughly two feet apart along the length of the wall. Drywall is then placed directly over the studs. Drywall alone can’t support the weight of a hammock like it could a simple picture frame, so you need to take advantage of the strength of the wall studs. First, find two opposing walls with enough room for your hammock. It’s a good idea to measure the hammock and tack on about four feet to the final measurement. Two feet on either side will give you enough wiggle room and allow you to adjust the slack accordingly. If you want to ensure that the wall studs are extra sturdy, hang one end to the corner of two walls. Corner studs often utilize up to three support beams, making it extra thick. Once you’ve found the walls you want, use a stud finder to locate the studs. Alternatively, you could tap on the wall to find the solid wall stud. Then, measure how high you want the hammock. Typically, the ends of the hammock are quite high at around 6 feet or more. This is to allow plenty of slack to swing. Once the proper position is found, it’s time to install the hardware. Many hammocks come with specific mounting gear to make things easier. Alternatively, you could use eye or lag hooks. Simply use an electric drill with a drill bit to match your mounting gear. Drill into the wall stud and screw the hook into place. It’s a good idea to use sturdy pliers for more leverage and power. From there, it’s all about hanging the hammock between the two hooks and giving it a try. The top plate is a horizontal beam that’s located above wall studs. It’s located at the point where the ceiling meets the wall. This is a great option for those that have lower ceilings or want a bit more security. The same method for securing hooks on wall studs can be used on top plates. Just drill holes for the hooks and screw them in. Alternatively, you can use two separate pieces of 2×4 to create a mount. The hook is screwed into a short piece of 2×4. This small mount is then attached directly to the top plate with long drywall screws. Screws that measure at least 3.5 inches in length will ensure that the mount is properly anchored into the top plate. Many drywall screws should be used along the top of the 2×4 mount for extra security. Ceiling mounts are used for hammock chairs. Unlike traditional mounts that use two anchor points, chairs only have one. 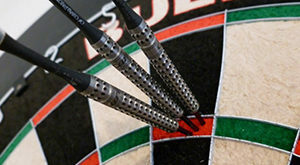 Simple lag or eye hooks can be used if specific hardware isn’t included. Hanging a hammock chair on the ceiling requires the use of a solid ceiling joist. Ceiling joists are just like wall studs. They support the second story or roof of the home. They’re typically wider than wall studs as they have more weight to support. If you have exposed joists or ceiling beams, use a drill to create a hole and screw in the hook. If there’s drywall, you’ll have to use a stud finder. Ceiling joists are typically spaced one food apart so you should have plenty of placement options. Hammocks come in a few different materials. The most common material is cotton or polyester rope. It’s soft, breezy, and very resilient. Many hammock-enthusiasts prefer rope because it stretches and offers greater flexibility than fabric. However, fabric can be more comfortable. This is especially true for indoor hammocks where sun or water damage isn’t an issue. Canvas or cotton provide a softer lounging surface and more structure thanks to the wooden separation beams that are often utilized. Size is an important consideration, especially if you plan on using the hammock for sleep. Generally, wider hammocks are considered to be more comfortable than thinner options. More width provides better support and more room to lounge. However, smaller options are available for those limited on space. It should be noted that size often dictates weight and versatility. A wider model will be heftier, more difficult to move, and pricier. The same goes for a chair hammock as well. It’s important to go with a hammock made from durable materials like strong fabric and thick rope. Hammocks can be very dangerous if they rip. If the entire hammock is made from rope, a single tear can result in the entire hammock collapsing. High-quality materials will ensure that the hammock will last for many years. Look for thick rope and additional wooden supports. They will help the hammock keep its strength while also improving its weight capacity. Hammocks can be mounted a number of different ways. It’s good to consider your hangout space and choose a mounting method accordingly. If you have strong walls and ceilings, go for a hanging option. If you’re worried about the strength or your building, go with a hammock that has an included stand. While these stands do take up more room, they support the hammock fully without affecting its comfort or swinging ability. Whether it’s a man cave or your living room, hammocks are the perfect addition to any hangout space. With a high-quality hammock and the proper mounting method, you can take a bit of the outdoors in. Indoor hammocks can be enjoyed all year long to provide you with hours of relaxation anytime you want.